I might be about the only person on the planet that isn’t head over heels in love with Frozen. I’m not a complete wet rag, I think the movie is fine, just not the best movie ever, or even the best Disney movie ever. I’m also not big on birthday parties. So, what then, did I eat, sleep, and breathe preparing for all last week? 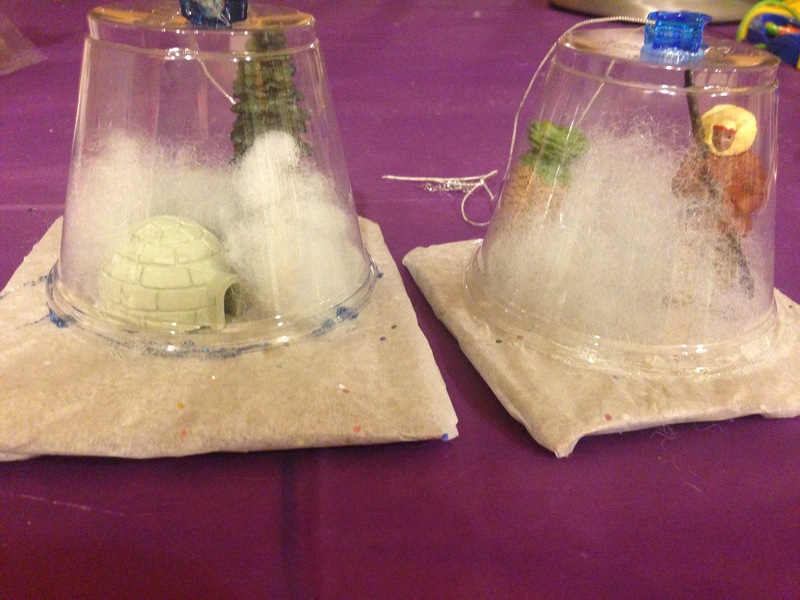 A Frozen birthday party, duh. Lila loves Frozen, as does seemingly every other child in the Universe. And, well, you only turn 5 once. So I said ok to making a cake and allowing one or two friends over for a play date. But the problem with my planning a small get-together with cake is that my get-together and cake ideas are never small. I admittedly suffer from delusions of grandeur when it comes to my (lack of) artistic ability and I can also get pretty carried away with trying to make everything just so and theme-related. And then I get stressed because there’s never enough time and there are too many supplies to buy and I’m staying up until the wee hours to bake this cake but I’m so sleepy I can barely see straight enough to ensure it looks like the perfection that I envisioned in my head and poor Hubs ends up running around to pick up last-minute items from stores that are already teeming with holiday shoppers and then somehow 2 kids turns into 10 and tell me again why did I ever think this would be a good idea?? 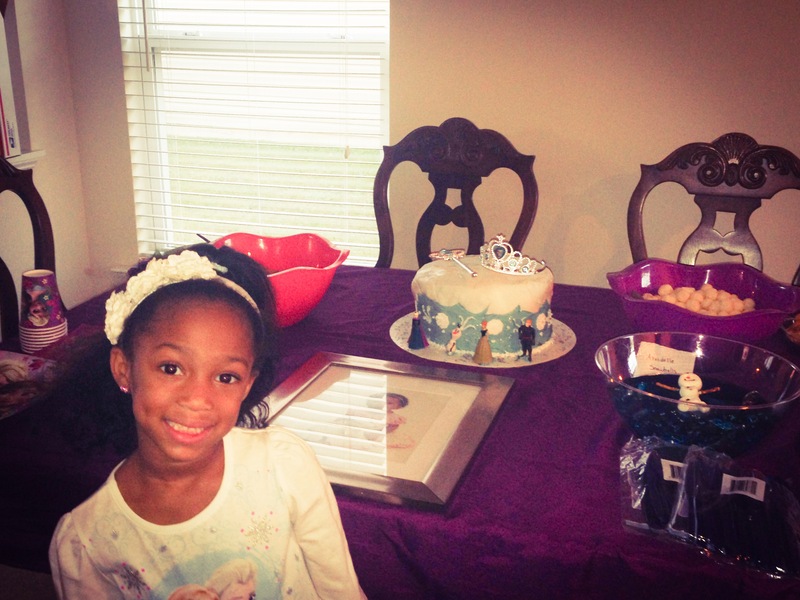 And then there’s Lil’ Miss Know- It- All, who wasn’t even privy to the fact that she was having a party and just thought Mommy was simply making her a cake, who watched me intently as I decorated before she announced confidently that I was making her an “Elsa cake”. 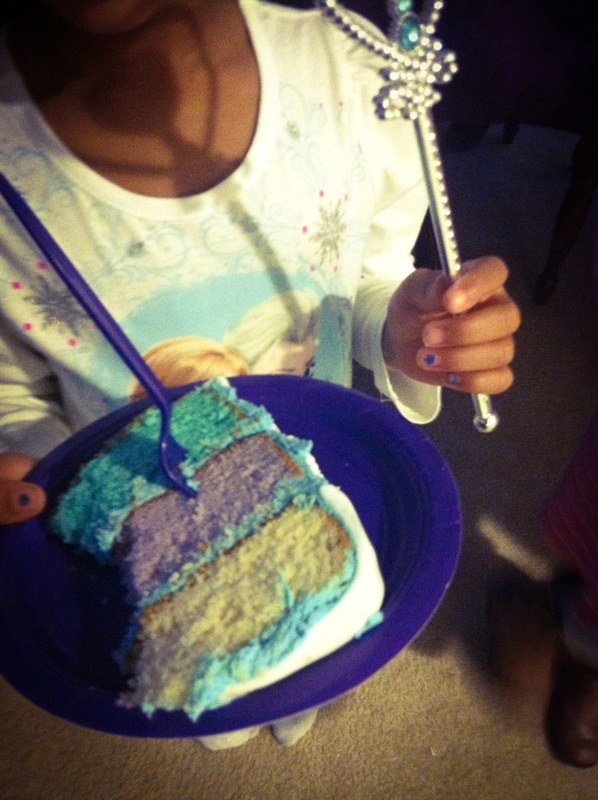 I asked her how was she sure of this and she said “because the frosting is blue, so it must be an Elsa cake.” I told her that meant absolutely nothing and that she shouldn’t set herself up for disappointment should her deductive reasoning prove shoddy. And she remarked that she wouldn’t be disappointed because she was positive that she was right. I just shrugged and continued frosting. There’s no arguing with an (at the time) 4 year old. And anyway, she was right. 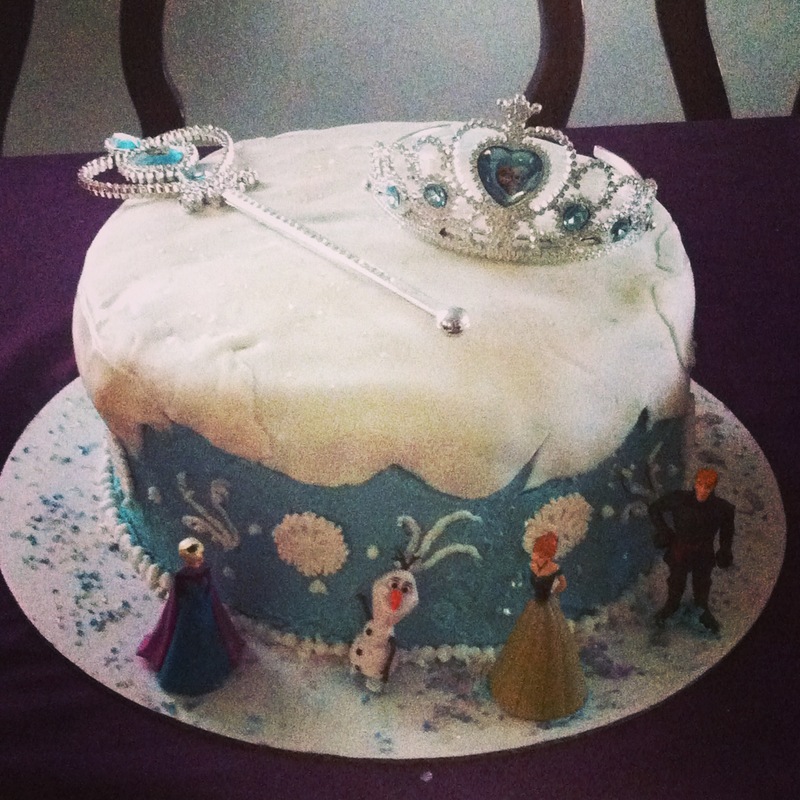 It was, indeed, an “Elsa cake”. 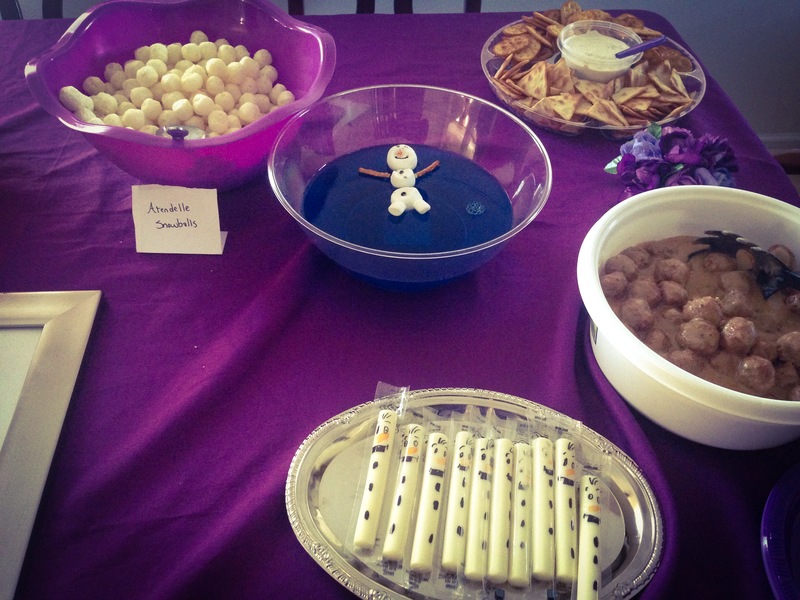 In addition to that, continuing along with the whole Frozen theme, we offered up Swedish meatballs, pretzel sticks as Sven’s antlers, carrot sticks as Olaf’s nose, white cheese puffs as Arendelle snowballs, an outstretched marshmallow Olaf floating in a blue jello lake, and Olaf’s likeness hastily scribbled on packages of mozzarella string cheese sticks. Oh, and pizza. Because that’s what snowmen like to eat. I was planning to let the Frozen movie play in the background but was trumped by the daddies in attendance that hoarded the TV and turned to football instead. It was no matter to the kids anyway as they were busy with their winter crafts. 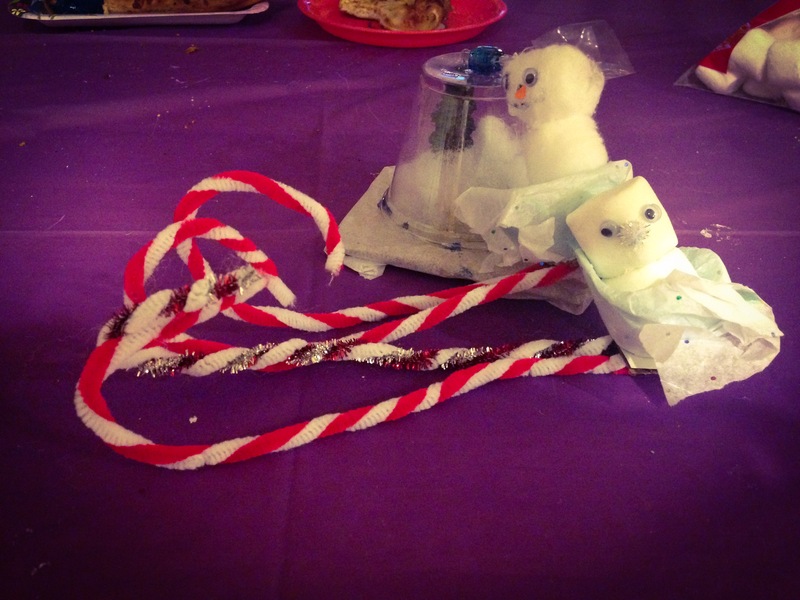 In keeping with the theme of snow, they created little snowmen sleds using either marshmallows or cotton balls for the snowmen, eggshell carton cups as seats and pipe cleaners as the candy cane sled runners, and they also made “snow scene” ornaments using clear plastic cups, Arctic-inspired toys, and quilting batting for snow. After everyone left, it looked like a frozen blizzard indeed had hit the place. And truth be told, several days later it still looks that way. Hubs and I have still not rested well nor yet recovered from all the running around. 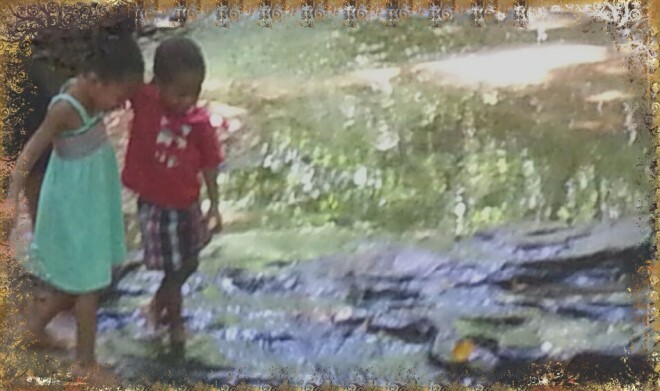 But I’m not complaining because fun was had by all and my baby girl was elatedly surprised and had a great time. And, well, you only turn five once. This entry was posted in Life, Parenting and tagged birthday, Cakes, celebrations, child, children, Disney, Elsa, Frozen, kids, Parenting, party. Bookmark the permalink. Home parties are the best – great job, Mom. This is great! And I so relate to the getting-in-over-your-head (will it be enough? Will it be good enough?) thought process. I love all the little special touches you do. Also. I got the DVD of Frozen from the library about a week ago. I got bored and wandered off and felt no pull to finish watching. (It seemed pretty formulaic/apparent how it would all turn out.) I don’t get all the fuss… and that snow man irritated me kind of like Jar Jar Binks. So you are *not* alone! Thank you, Colette, I appreciate that. And re the movie, I thought I might be excoriated for not being on the Frozen bandwagon; it’s good to know I’m not the only one.